In recent years, the Black Lives Matter and Me Too movements have given minority groups a platform to voice their grievances and concerns, and most of the major U.S. news outlets have reported on these movements. However, minority voices and viewpoints used to be largely underrepresented in the media. For most of the twentieth century African Americans relied on the African American press for their information needs. During the Progressive Era African Americans began printing their own news in all major cities with strong African American populations: New York, Philadelphia, Atlanta, Baltimore, Chicago, Los Angeles, Cleveland, Norfolk and Pittsburgh. 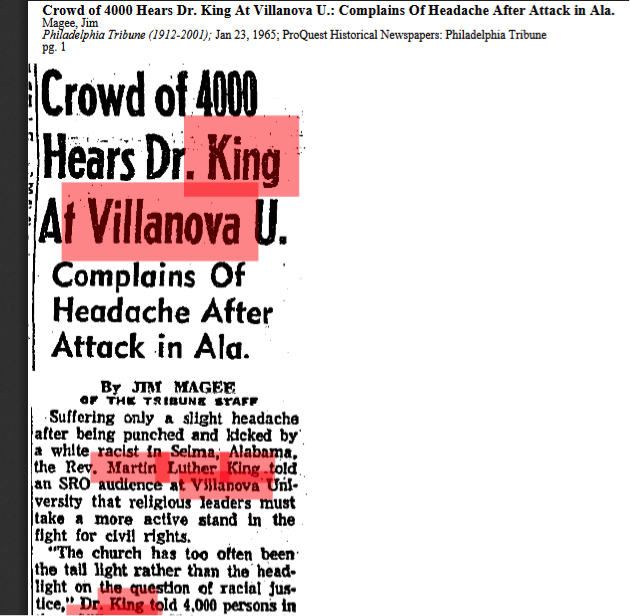 ProQuest has digitized the print archives of the most influential African American newspapers as much as they survived, and the Villanova community can now access them through the Library’s website. The Black Historical Newspapers collection includes The Baltimore Afro-American, founded in 1892 by John H. Murphy, Sr. and one of the most widely circulated black newspapers on the Atlantic coast. It remains in print today under its new name Afro. Also included are the Chicago Defender, founded in 1905 by Robert S. Abbott, a newspaper that exposed Jim Crow laws in the South and urged African Americans to move north to improve their lot. Today the Defender is the oldest newspaper in Chicago. Noteworthy for scholars with local history interests will be the Philadelphia Tribune, founded by Christopher J. Perry in 1884. It is the oldest continuously published African American newspaper in the country. Other newspapers in the collection are the Atlanta Daily World, the Cleveland Call & Post, the Los Angeles Sentinel, the New York Amsterdam News, the Norfolk Journal & Guide, and the Pittsburgh Courier. The first African American newspapers in the country were founded in the early nineteenth century. The Villanova community has access to digital copies of some of these publications through African American Newspapers: The 19th Century. The collection includes the Freedom’s Journal, the first African American owned and operated newspaper, the Christian Recorder, The North Star, and Frederick Douglass’ Paper. Wolseley, Roland Edgar. The Black Press, U.S.A. [1st ed.]. Ames: Iowa State University Press, 1971. Pride, Armistead Scott., and Clint C. Wilson. A History of the Black Press. Washington, DC: Howard University Press, 1997. Simmons, Charles A. The African American Press: A History of News Coverage During National Crises, With Special Reference to Four Black Newspapers, 1827-1965. Jefferson, N.C.: McFarland & Co., 1998. Hutton, Frankie. The Early Black Press in America, 1827 to 1860. Westport, Conn. ; London: Greenwood Press, 1993. Newkirk, Pamela. Within the Veil: Black Journalists, White Media. New York: New York University Press, 2000.